While Sony listed the impact that the closure of Gravity Rush 2’s online services would have on the game, which includes making 10 unique in-game items impossible to acquire, it since occurred to me that it may have more repercussions. Spread throughout Gravity Rush 2’s world are treasure boxes for the player to find. The first 32 of these contain unique items for the player to collect. These items consist of 6 gestures, 10 photo items and 16 talismans. From the start of chapter 3, an additional 26 items can be obtained from the chests: 25 furniture items for decorating Kat’s home, and 1 talisman. By far the easiest way to access these treasure boxes at the moment is through the online Treasure Hunts. Via the online services, players periodically receive a photo sent by other users. 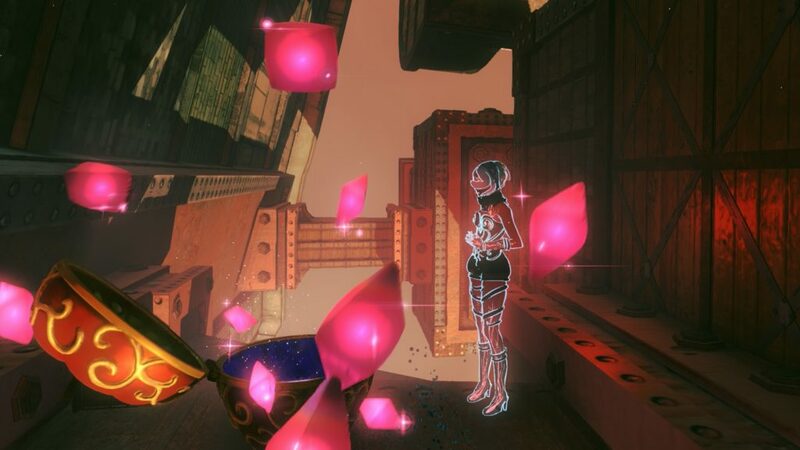 These photos point to a location of a treasure box in one of Gravity Rush 2’s cities. If the player finds and opens the treasure, they receive a few Previous Gems as well as one of the 58 unique items (until the player has acquired all of them). After that, the player can take their own photo of the treasure box they found and upload it as a Treasure Hunt for other players. Now, these treasure boxes can also be found when you’re simply exploring the world and participating in an active mission. But I only found a handful of treasure boxes this way in the time I spent playing the game. Even assuming that this method will remain available after the online services close down, people starting a new game would need to find 58 of these treasure boxes to unlock all the unique items (and probably a few more, as some treasure chests might not give you an item for some reason, even if you don’t have all of them yet). In practice, that’s going to be a very tedious task. One of our followers on Twitter examined how much time it would take to find the treasure chests if you’re offline, and he was kind enough to share the results. It took him around 50 hours to find 4 treasure chests, by specifically looking at locations where they appear. It’s obvious that the developers didn’t account for the possibility that the servers would go offline anytime soon, further evidenced by this in-game message which specifically tells people to complete treasure hunts to find furniture to decorate Kat’s home. While the items won’t be gone entirely when the servers go down (unlike the items that are unlocked via Dusty Tokens), I imagine this is another point where the closure of the online services ends up hurting the game. As I couldn’t find information on all the items locked within treasure boxes, I ended up starting a new game to make a list of my own. You can view the result below. I’m confused. Regarding the person who took 50+ hrs looking at KNOWN locations and only found 4, is it because he looked in the wrong place or… not all treasure locations will have a treasure at the same time and a random location is chosen? If so, then even if you know exactly where all the treasure locations are, you will need to revisit the sites repeatedly hoping this time that location has something. The person indeed looked at the correct locations, but it’s not certain that there will be a treasure chest. There are hundreds of locations where one may spawn, but the chance of it actually being there is very low. That’s the core of the problem. In all the time I’ve played the game, I’ve encountered less than 10 “offline” treasure chests. Can you update this page please? You seem to know about 3 more items. If you plan on sharing the info you better do it now since there’s only 2 weeks left. I think you’re referring to an older comment I made in Twitter? That was a miscalculation, as far as I know this article has all the items. Alright, perfect. Thank you for your hard work.